Theme and Variations is one of my favorites, having seen this Balanchine classic many times. The work, which Ballet Theatre premiered in 1947, was intended to honor the period when Russian ballet flourished with the aid of Tchaikovsky’s music. ABT performed this work Saturday evening with Polina Semionova and Cory Stearns as leads. Polina was outstanding, completely in control and at ease throughout this difficult piece. Tricky segments include a multiple fouetté turn section with alternating arms into a pas de chat jump, a rapid beat section, and double pirouettes from first position into a pas de chat, all requiring rapid fire execution to keep up with the music. Polina pulled off all of these segments with grace and style, one of the best performances that I have seen from her. Her phrasing with her arms was on the mark with the beautiful Tchaikovsky score. The two danced well together in the pas de deux; Polina completed several long balances as she alternated arms with Cory in support before going into a penchée. Speaking of Theme, I ran across a YouTube clip of Baryshnikov and Kirkland from 1978 on PBS. Baryshnikov’s solo at 7:55 is spectacular with his high rond de jamb leaps with alternating arms and perfectly controlled tours. Stanton Welch’s Clear (2001) featured Sascha Radetsky, Thomas Forster, Daniel Mantei, and six other male dancers all dressed in tan colored pants and no shirt. Paloma Herrera was the sole female dancer. Although some have have criticized the work as sub-standard, I like the piece, which showcases bravura and adagio male dancing set to a beautiful Bach score. Sascha was very good as he showed off his washboard abs and numerous tattoos. The piece features a fouetté section in which the dancer changes his spot from the front, to the side, back, side and front again. He executed this quite well along with turns in other sections. Forster and Mantei are members of the Corps and are featured in several leading roles this fall season. They were paired in a duet to slow music, requiring substantial control. David Hallberg excelled in this role which showed off his substantial extension in a développé section. I enjoyed their adagio section Saturday and I look forward to seeing more of their dancing. Craig Salstein had a nice turn/pirouette section similar to Theme and Variations. Joaquin de Luz, now at New York City Ballet, was my favorite in that role, as he would pull of multiple double tours. Paloma Herrera worked well with Sascha and the piece ended with the two in a shrinking spotlight. Romeo and Juliet is a successful ballet because the plot is simple, allowing someone unfamiliar with the work to follow the storyline of the ballet. In contrast, I knew The Tempest would be a challenge after I read the synopsis three times and still had problems following the plot and the relationship between the 11 main characters in the ballet. The complexity and short period of time (about 40 minutes) to tell the complex story are the main problems with the ballet. Characters such as Ferdinand (Joseph Gorak) just walk in unannounced, their characters completely undeveloped. In one section, a group of women walk in dressed in blue with strange headdresses. I couldn't figure out their function, nor could my smarter half (my wife). In another part, very tall thin things (trees, ornaments?) were rolled on stage. I had no idea of their purpose. The costumes reminded me of a Greenwich Village Halloween parade. Although I didn’t like the work, I did enjoy the dancing. 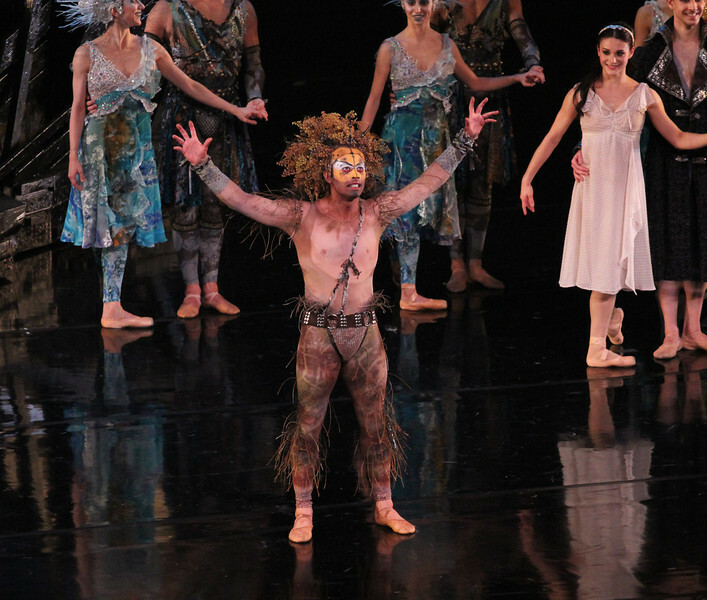 Marcelo Gomes as Prospero, complemented the lovely Sarah Lane (Miranda, his daughter). Gorak showed his great extension and range as Miranda’s future husband. Herman Cornejo was the grotesque Caliban, an inhabitant of the island, impressive in his beast dance. Daniil Simkin showed his technical prowess, featuring his fine double saute de basques. This is a traveling step in which the dancer turns twice in the air with one foot drawn up to the knee of the other leg. He also showed off his trademark pirouettes to a double tour off one leg. See Alistair Macaulay of The New York Times Alaistair Macaulay of The New York Times, Haglund's Heel, and Marina Harss of DanceTabs for more commentary on The Tempest.